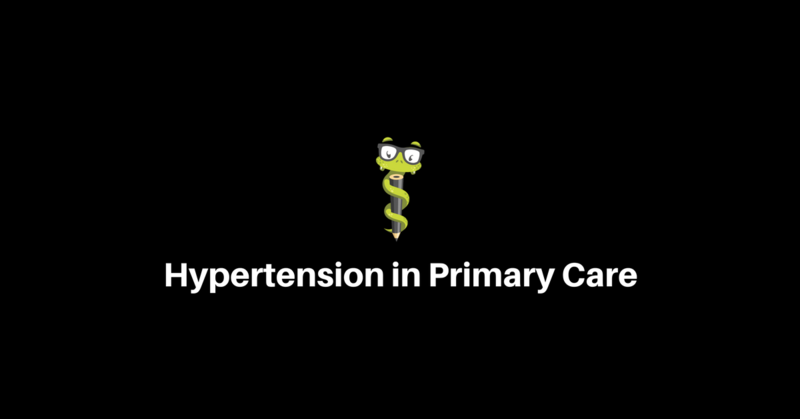 Hypertension is one of the most common reasons for office visits to primary care and urgent care clinics every day in the United States. It is estimated that one in every three adults in the U.S. has hypertension. Of this population, it is thought that only about 50% of those patients have adequate control of their blood pressure via diet, exercise or pharmacologic therapy. We will recall from our clinical cardiology and anatomy classes that the value of blood pressure is obtained as both systolic and diastolic values. The systolic blood pressure is the pressure measured during ventricular contraction, while the diastolic blood pressure is the measure during diastole, or the relaxation phase. The blood pressure measurement is a function of Cardiac output multiplied by systemic vascular resistance and is constantly fluctuating based on stress, environment, medication, and exercise. As most of you may know, the American College of Cardiology and American Heart Association have recently changed the guidelines and values necessary for diagnosing hypertension, which has cast some controversy on the diagnosis. The “normal” range is now less than 120 over 80. Elevated blood pressure or “pre-hypertension” is now categorized as 120-129/80-89. Stage 1 Hypertension is defined as 130-139/90-99 and Stage 2 hypertension is any blood pressure reading greater than 140/90. Pre-Hypertension: 120-129 systolic/ 80-89 diastolic. One of the main challenges in primary care is obtaining an accurate blood pressure. With the scores of new tasks to complete at each office visit, patients are often speaking, stressed out, or have their blood pressure checked immediately coming into the office. An excellent first step in obtaining an accurate blood pressure is to review with clinical staff the proper way to measure blood pressure. To start, patients should be seated calmly for 5 to 10 minutes prior to checking a blood pressure. They should not be speaking during the reading. Patients “running up the stairs to come to the office” should be allowed to catch their breath and relax. Patients should be allowed to empty their bladder, sit comfortably with their arm at the level of their heart, and their back supported, feet flat on the floor. Patients should be asked about tobacco and caffeine consumption within the last hour. Patients in significant pain, emotional distress, should be given time to relax prior to blood pressure check. As far as the physical measurement, the correct sized blood pressure cuff is essential. The width of the bladder of the cuff should be 40% of the circumference of the upper arm. The length of the cuff should be about 80% of the upper arm circumference. If the wrong cuff is chosen, the blood pressure may be grossly under-estimated or over-estimated depending on the discrepancy (Bickley, 2013). The ”gold standard” measurement for blood pressure measurement in the office starts with all of the above being accomplished to ensure an accurate measurement. Once a properly sized blood pressure cuff is used, the bladder should be inflated while the examiner palpates the radial artery. Once the cuff is inflated, the clinician should feel for the disappearance of the radial artery. The cuff should then be inflated 30 mm/hg above that value. This is essential to prevent missing the ausculatory gap, which is an interval of silence that might be apparent between the systolic and diastolic blood pressure. Once measurement begins, the cuff should be deflated 2 to 3 mm/hg per second. When two consecutive sounds (Korotkoff) are heard, this is the systolic blood pressure. Examiner should continue to purposefully deflate the cuff and when the sound disappears, this is the diastolic blood pressure. The blood pressure can be repeated in the opposite arm and averaged. If the initial blood pressure is high, having the patient sit calmly for 5 to 10 minutes and re-checking may help the patient relax and improve blood pressure reading. Risk factors for hypertension are multiple. Patients’ blood pressure does increase with age, particularly the systolic BP. Other considerations include obesity, family history, race, physical inactivity. Salt consumption does increase blood pressure. The average American eats double the recommended intake of sodium per day. Medications that may increase blood pressure include oral contraceptives, NSAIDs, TCAs, SSRIs, OTC decongestants, clozapine, cocaine, caffeine, stimulants, and methamphetamines. Secondary causes of hypertension will be covered elsewhere. A previous article dedicated to the diagnosis of pheochromocytoma is available for review. Other considerations include renal artery stenosis, fibromuscular dysplasia, Cushing’s Syndrome, drug use, obstructive sleep apnea, and others. Colloquially, hypertension is known as the “silent killer” as many patients do not have any symptoms associated with hypertension. The long term complications of hypertension are many and paramount to patient morbidity and the increasing cost of health care. They include, but are not limited to: left ventricular hypertrophy, heart failure, stroke, intracerebral hemorrhage, myocardial infarction, chronic kidney disease, and is a leading cause of end stage renal disease. Making the diagnosis of hypertension occurs longitudinally over a few visits. Generally the diagnosis is made if the blood pressure is consistently greater than 140/90 on two or three different occasions. The United States Preventive Task Force Service recommends hypertension screening yearly in all patients age 18 or greater. In addition to the measurement in the office, another avenue for diagnosis is ambulatory blood pressure monitoring. This is accomplished over a 24 hour period where a patient wears a blood pressure cuff and it measures BP every 15 to 20 minutes or so during the day and periodically during the patient’s sleep. This method can be used to confirm the diagnosis of hypertension or compare blood pressure values to those obtained in the office setting. A reasonable practice in the outpatient setting is to identify patients with elevated blood pressure in the office, order basic lab work and have patients return longitudinally over a period of a few months for repeat blood pressure checks. All patients with elevated blood pressure or hypertension should initially be “prescribed” education and instructions related to dietary and exercise changes. The American Heart Association recommends at least 30 minutes of moderate exercise daily. Patients will benefit from weight loss as well. The Dietary Approaches to Stop Hypertension, or DASH diet has been created as a recommendation for hypertension patients. The diet emphasizes fruits, vegetables, low fat, poultry, fish, nuts, and low in overall refined foods. Increasing dietary potassium and decreasing salt in the diet can be helpful as well. Patients should not consume more than 2,000 mg of sodium daily. Patients with excessive alcohol consumption should be counseled to reduce their alcohol intake. The decision to initiate treatment via pharmacotherapy is multifactorial and individualized between clinician and patient. Serial blood pressure monitoring is important. A trial of diet and exercise is reasonable in patients with mildly elevated blood pressure and no comorbid conditions. According to many sources, the choice of blood pressure medication is not nearly as important as the reduction in blood pressure and reducing the risk of long term complications related to uncontrolled hypertension. The three main classes of medications include Angiotensin Converting Enzyme Inhibitors (ACEI), calcium channel blockers, and thiazide diuretics. Beta blockers are no longer recommended as first line treatment for hypertension. There are compelling indications for patients with certain diseases who may benefit from specific medications. African Americans generally benefit better from CCBs or thiazides as a first line. In patients with diabetes, proteinuria, or chronic kidney disease, an ACEI or ARB is preferred. In patients whose blood pressure is markedly elevated, combination therapy is recommended. Generally if a patient’s blood pressure is greater than 160/110, a single agent likely will not provide optimal control. Combination medications do exist. An ACEI can be combined with a CCB or thiazide. ACEI and ARB medications should not be combined. Patients should be followed up within 4 to 6 weeks after initiation of medication. It is reasonable to ask the patient to check their blood pressure at home, as it is likely to be lower than in the office. Drug resistant hypertension is defined as a patient on at least three blood pressure medications without adequate control of their BP. Patients on ACEI and losartan should be monitored for hyperkalemia. Other significant side effects include cough, angioedema, rash. Thiazide diuretics are relatively well tolerated but may cause hypokalemia which can result in cramps. They can also cause hypercalcemia and hyperglycemia. Calcium channel blockers may cause dizziness, hypotension, flushing, headache, and peripheral edema. As discussed previously, the goal of initiating hypertension management is to prevent long term complications of hypertension such as heart failure, myocardial infarction, stroke, and end stage kidney disease. The recommended goal for patients without significant comorbidities is a target BP less than 130/80. Routine following and management is advised to continue to track goals and assess medication compliance. Routine lab work to screen for progression of kidney disease and electrolyte imbalances is also paramount. Basile, J. and Bloch, M.J. (2018). Overview of Hypertension in Adults. UpToDate. Date of Access 22 March 2018. Bickley, L.S. (2013). Bates’ Guide to Physical Examination and History Taking. Wolters Kluwer, Philadelphia, 11th edition. Brzezinski, W. (1990). Clinical Methods. Multiple Authors, 2017 Guidelines for the Prevention, Detection, Evaluation, and Management of High Blood Pressure in Adults. ACC/AHA.